Recent snow has made the city look like a winter wonderland. View other Skywatch Friday photos. Marvellous shot! There's nothing like sun and snow! It really looks like wonderland. Oooooh wonderland indeed, how very beautiful ! This is truly beautiful! I like the angle too. That dog is loving it, too!! A wonderful, white, wonderland indeed! I love this photo! Fun to catch up on your blog today! Snow does help create wonderland. Great photo! Beautiful New England! I used to live right behind that majestic building. 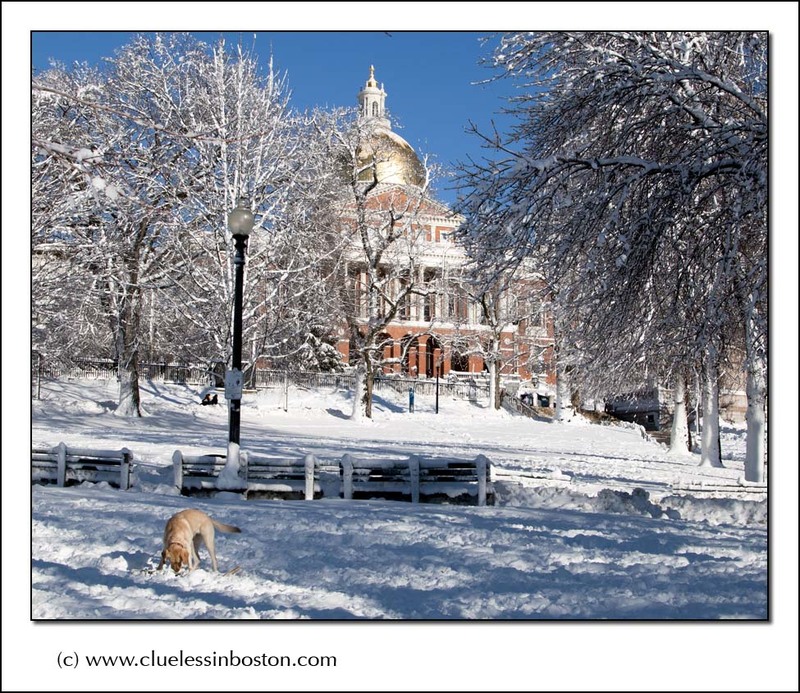 Teresa, I used to live right beside the State House on Bowdoin, so we are practically long-lost neighbors. Blue skies, white snow, perfect photo. A real wonderland, especially with that marvellous blue sky! that's so inviting! That is a nice perspective to see the State House. The dog adds a certain something, too! The dog add the little extra to it.